Are you one of those people who have sticky notes and lists littering your desk? I was - until I found Google Keep. Access to my sticky notes whenever, where ever, no matter what device I'm using. 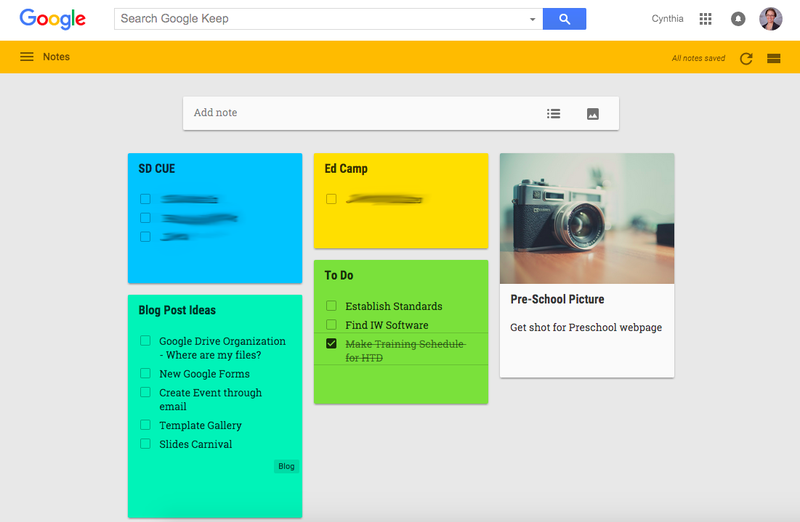 You can make to do lists, set reminders, add pictures, and change the color of your notes. To add a new note, simply click on "Add note" in the white bar near the top. If you know you want a list, you can click on the little list icon on the right side of the bar. If you know you want a picture note, click the picture icon. Once you begin editing your note - you will have several different options. You can get reminders about your note, share it with others, change the background color, add an image to your note, or archive it (not delete it, but get it off the screen until you need it again). If you click on the three little dots to see more options, you can delete the note, add a label (for tracking your notes easier), make a copy of the note, choose to have checkboxes for a little list, or even copy to a Google Doc (the copy to Doc option will only show up once you have typed in some text). 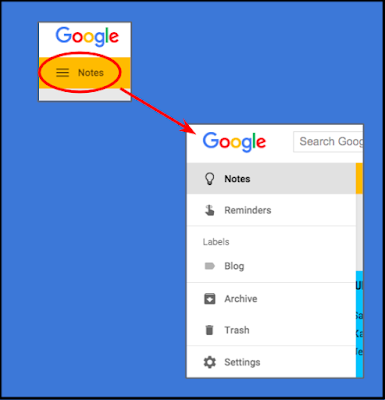 I love the "Copy to a Google Doc" option because if I start a list or some brainstorming on a note, I can click that and it will create a Google Doc with the text and/or photo that was in my note and it gives the document the same title as the note. Pretty handy! On the upper left hand side of your screen, you can click on the little menu to see a few more options. You are already on the "Notes" page. You can click to see your reminders, filter notes by labels, see what you have Archived or even what you have deleted. Under settings you can enable sharing of notes. Take a moment and check it out. If you like it, you just might be able to get rid of the crazy sticky note parade.